With a simple, yet impressive, ingredient list, these whole-grain sorghum cakes couldn’t be any easier to make. 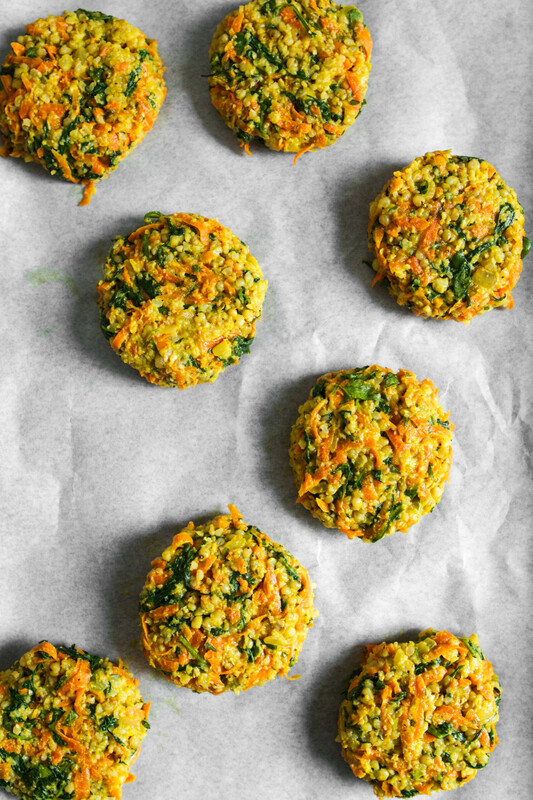 And when you throw carrots, arugula, curry, and a hearty amount of garlic into the mix, they also don’t lack any oomph. 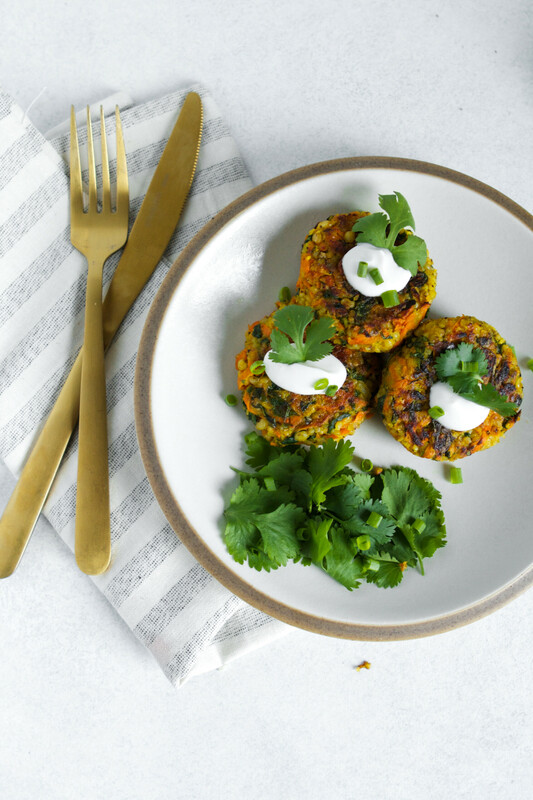 These Curried Sorghum Cakes are definitely weeknight-dinner fare. For some reason figuring out what to make for dinner is continually a struggle for me. Even though I develop recipes as my full time job and for this side hustle, I still find daily dinner inspiration nearly impossible. And don’t even talk to me about lunch. 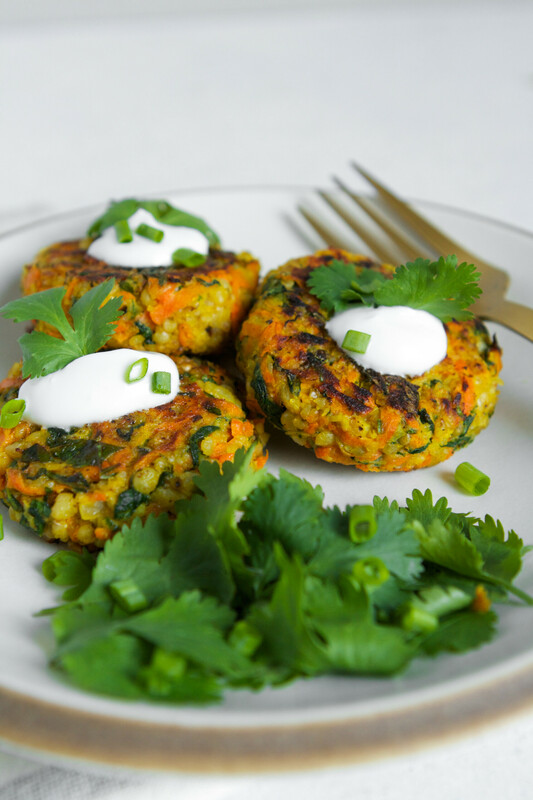 I’m not exaggerating when I say these curried sorghum cakes literally and figuratively saved me last week. I had them for almost every lunch and a handful of dinners. Some meals they were the main event, and for others they were a great addition to a green salad or roasted veggies. These are the kinds of recipes I love. Simple, healthy, packed with flavor and can feed me throughout the week. But, as you know, those can be hard to come by! That’s why I’m making a conscious effort to offer more recipes designed for weeknight dinners and that also make great leftovers. Anyway, back to them baby cakes. 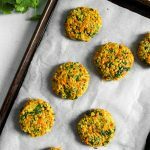 These tender cakes are made with white whole sorghum grain, which when cooked, has a delightful chewy texture and nutty flavor. 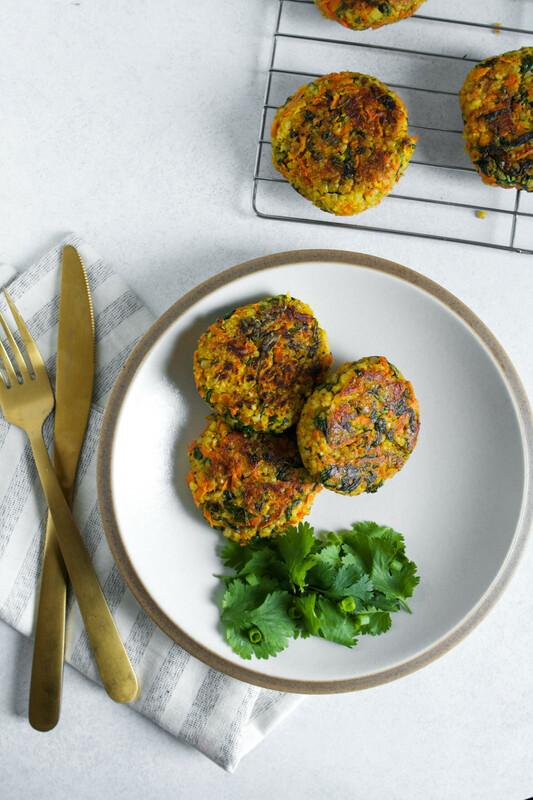 It’s great for pilafs or salads, and when pulsed in a food processor, it takes on a sticky texture, perfect for forming into patties or “meatballs.” And with a good amount of iron and protein, sorghum makes these cakes a wonderful vegetarian (and gluten free) option. Cooking whole sorghum grain takes some patience, but it’s mostly hands off, so it’s easy and well worth the wait. I like to make a batch at the beginning of the week and throw it over salads, toss it into soups right before serving, or enjoy it for breakfast as a hot cereal with almond milk, fruit, and nuts. These whole-grain sorghum cakes couldn’t be any easier to make. 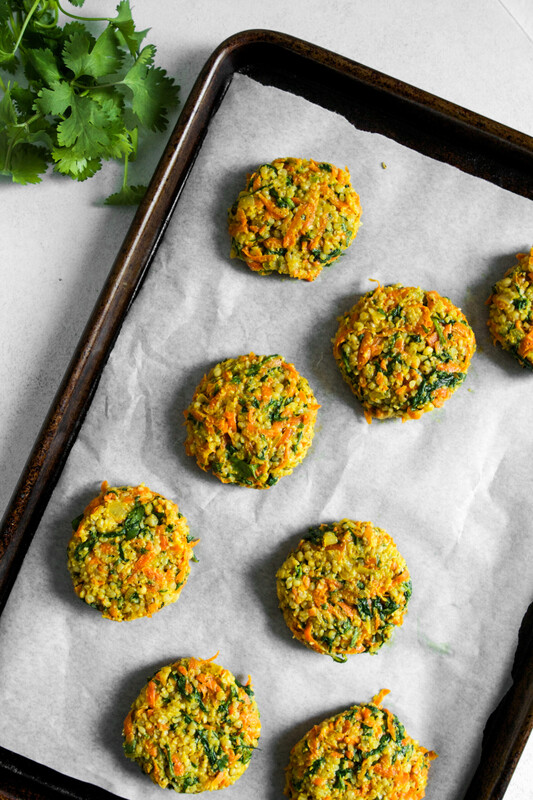 With carrots, arugula, curry, and a hearty amount of garlic, they pack a lot of oomph. 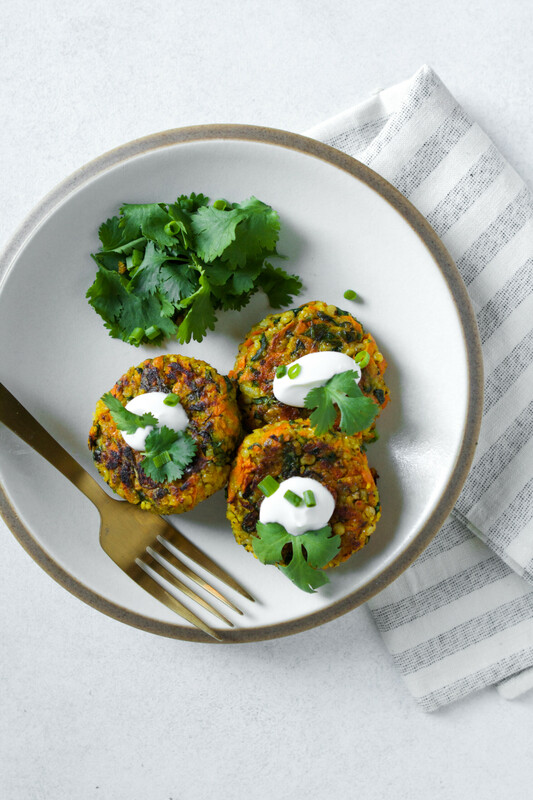 These Curried Sorghum Cakes are definitely weeknight-dinner fare. Bring water, sorghum, 1 teaspoon oil, and ½ teaspoon salt to a boil in a medium saucepan over high heat. Reduce heat to low, cover, and simmer 80-85 minutes until grains are tender and water has been absorbed. Remove from heat, fluff with a fork, and let cool completely. Transfer cooked sorghum to a food processor and pulse until the grains are chopped and start to stick together, about 20 one-second pulses; transfer to a large bowl. Heat 1 tablespoon oil in a skillet over medium until shimmering. Add shallot and cook until softened, about 2 minutes. Stir in arugula and carrots and cook until arugula is wilted, about 2 minutes. Stir in garlic, curry powder, and 1 teaspoon salt, cook until fragrant, about 30 seconds; season with pepper. Add arugula mixture to bowl with sorghum and toss to combine; wipe out empty skillet. Add ¼ cup yogurt, egg, and cilantro to sorghum-arugula mixture and stir to combine. Divide mixture into 8 portions (¼ cup each) and pack into firm ½-inch-thick cakes. Transfer cakes to prepared sheet and chill until firm, about 30 minutes or up to overnight. Heat oven to 350°F. Coat a baking sheet with nonstick spray then transfer chilled cakes to sheet. Coat tops of cakes with nonstick spray and bake 15 minutes. Flip cakes and bake 10–15 minutes more until edges are crisp and cakes are cooked through. Heat oven to 200°F and set wire rack inside baking sheet. Heat 1 tablespoon oil in skillet over medium until shimmering. Gently lay 4–6 cakes in skillet and cook until golden brown and crisp on both sides, about 5 minutes per side. Transfer cooked cakes to prepared sheet and keep warm in the oven. Repeat with remaining cakes and additional oil. 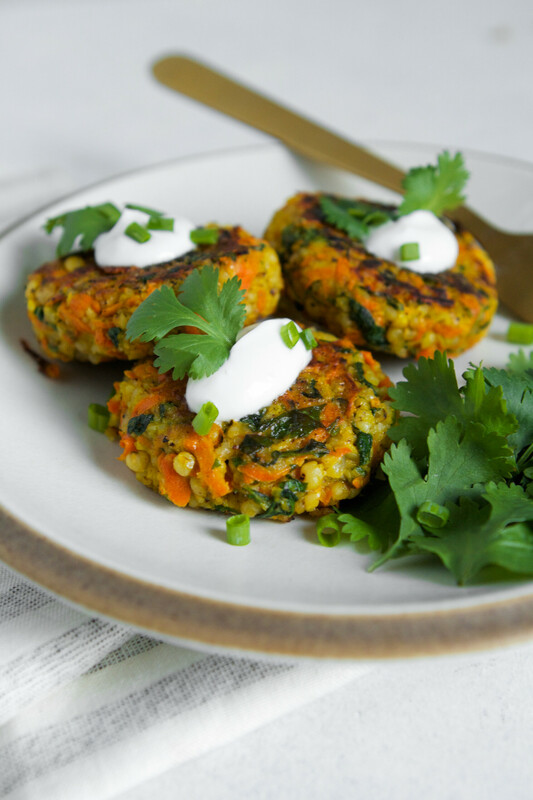 Serve cakes with a dollop of lightly sweetened greek yogurt, cilantro, and scallion greens. Additional oil listed in ingredient does not have a specified amount due to which cooking method you choose to use. If you choose to cook on the stove top in a skillet, you will need 2–3 more tablespoons oil. To quicken cooking time, cook sorghum up to 3 days in advance. Store cakes in an airtight container, refrigerated, for up to 5 days. Cooking and prep time do not include chilling or cooking of sorghum due to being hands-off time. This post was created in partnership with Nu Life Market. As always, all thoughts and opinions are my own, thanks for supporting companies who make Zestful Kitchen possible! This looks easy enough that I won’t mess it up! Adding this to my “must try” list! I’ve never made anything with Sorgum grain before. These look like the perfect way to try it. Sounds so yummy, filling, and healthy! Thanks Shann! Sorghum is so incredibly versatile, I love it! 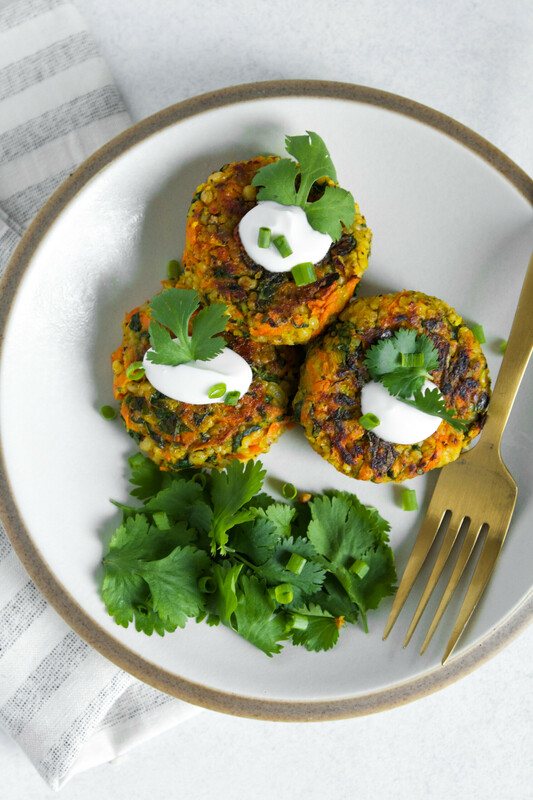 These look so pretty and full of flavor! Definitely pinning and adding it to my list of “must try.” It seems like something I might be able to handle and not mess up! Hi Melissa! Totally doable, I’m always available if you have questions! Beautiful! I bet they taste delicious. I tend to not use sorghum as much as I have such a hard time finding it. I am surprised it is not more readily available! Rebecca, I totally agree, I’ve heard the same thing from a couple of readers. I hope that changes in the next few years. For this recipe, I have found that farro works really well in place of the sorghum grain. I use 2 cups cooked farro in place of the cooked sorghum! I NEED these in my life! I’m thinking these are going on the list for next week. Yay! 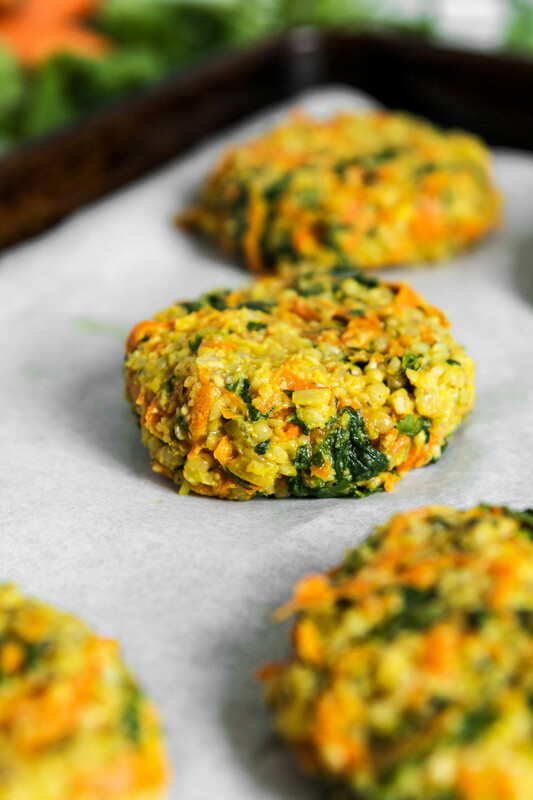 They are pretty tasty, they make great lunches for the week too! Hi, do you have a substitute recommendation for the sorghum? It’s not available near me. Hi Francesca! Cooked faro or barley will work perfectly in these cakes. I haven’t tested quinoa and I think the small grains of quinoa might not stick together quite as well. I hope that helps!